One of the most powerful features of the Home Equity Conversion Mortgage (“HECM”), also knows as “Reverse Mortgage”, is the reverse mortgage line of credit. What makes the reverse mortgage line of credit so special is the fact that there is a growth rate attached to the unused portion of the line of credit. In other words, when you are not using the line of credit, your available credit grows. The video above explains this incredible feature of the reverse mortgage program. I have found the line of credit to be one of the most attractive features to seniors considering a reverse mortgage. However, it is important to note that the line of credit feature is only available with the adjustable rate products. Seniors desiring a fixed rate reverse mortgage will not be able to receive the line of credit feature. In my humble opinion, the availability of the line of credit makes the adjustable rate program the superior reverse mortgage program (FYI, I am a huge proponent of the annual adjustable product. I am not a big fan of the monthly adjustable, however, I will save my reasons for that for a different article). The amount the line of credit grows is determined by adding the current interest rate on the loan plus the mandatory 1.25% yearly mortgage insurance premium. For example, if you have a margin of 2.75 and you are on the annual adjustable program which currently utilizes the LIBOR index, you would add 2.75 plus 1.73 (the amount of the 1 Year LIBOR as of today, August 11, 2017) plus 1.25. In this instance the growth rate on the unused portion of the line of credit would be 5.73%. That is huge! For example, if you have a $100,000.00 line of credit and did not use any portion of it during the year your available credit would grow to $105,730.00 at the end of the first year! If you did not use any portion of that during the second year (and presuming the 1 year LIBOR was the same at the time of its annual adjustment) your available line of credit would grow again at the end of the second year by $105,730.00 x 5.73% or $111,788.33. And so on and so on. It is a fabulous feature that sets reverse mortgage line of credits far ahead of tradition HELOCs. Reverse mortgage lines of credit also provide seniors with flexible payment options. Unlike traditional HELOCs that require payments (usually interest only at the inception that later turn into fully amortized payments) the reverse mortgage line of credit allows seniors to either make no payment at all (which, of course, would result in the borrower’s unpaid principal balance to grow) or as much as little as the senior desires. In other words, seniors can make payments on the amount money that they pull out of the reverse mortgage line of credit. Seniors can either make full payment or partial payments. The amount the senior can pay is up to them, either no payment, full payment or partial payment. Reverse mortgages do not have prepayment penalties so there is nothing prohibiting seniors from paying back what they have borrowed. Of course while reverse mortgages do not require seniors to make payments, seniors are still responsible for continuing to pay their property tax payments, homeowner’s insurance and maintenance costs. The flexible nature of the reverse mortgage line of credit is another feature which sets the reverse mortgage line of credit far ahead of the traditional HELOCs. Reverse mortgage lines of credit also provide security to seniors in that they can rest assured that their line of credit cannot be reduced or revoked. Traditional HELOCs can unilaterally be reduced or revoked by the lender. One of the major ancillary affects of the most recent housing crisis was the fact that many lenders mitigated their potential risk by reducing, and eventually, their greatest exposure, their outstanding lines of credit. This reduction and revocation caught millions of homeowners off guard, especially those that were relying on access to their homes equity to survive during these troubling times. Seniors that obtain reverse mortgage lines of credit will have security of knowing that their lines of credit will remain open and continue to grow according to the terms of their note. This security is something that HELOCs cannot provide. Finally, unlike reverse mortgage lines of credit, traditional HELOCs are typically recourse loans. Reverse mortgage lines of credit are nonrecourse loans. Nonrecourse loans mean that the lender’s sole ability to recover is against the value of the property and nothing more. Reverse mortgage lenders cannot go after a senior, the senior’s estate or any of their beneficiaries. Reverse mortgage lenders are restricted to recover only against the value of the home itself. This nonrecourse feature of reverse mortgage lines of credit provides seniors with the peace of mind that no matter how much they eventually owe on the unpaid principal balance of the loan, their reverse mortgage lender’s only recourse is against the home. 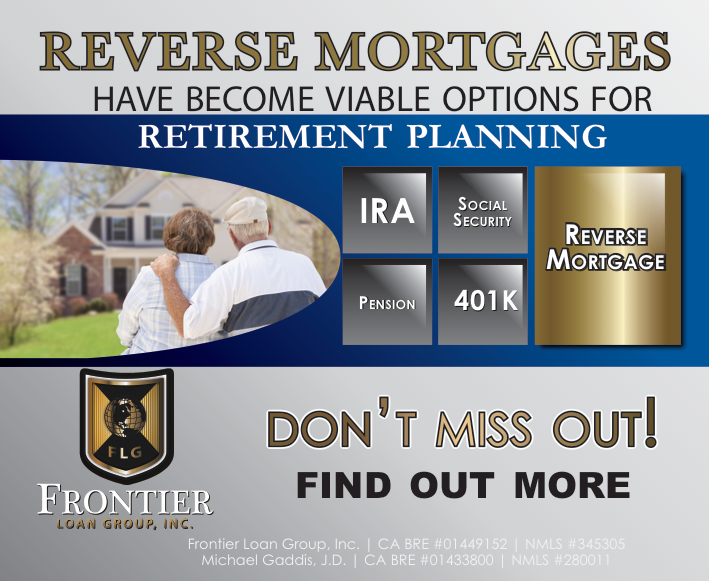 If you or someone you know is considering a reverse mortgage in the near future please tell them to call Frontier Loan Group, Inc. Michael Gaddis, J.D. is the CEO & Broker of Frontier Loan Group, Inc. He is a frequent speaker on the topic of reverse mortgages conducts reverse mortgage workshops throughout the State of California. For more information please call Michael Gaddis, J.D. today at 760-692-5950 or email Michael Gaddis, J.D. at Michael@FrontierLoanGroup.com. Frontier Loan Group, Inc. CA BRE #01449152 NMLS#345305 Michael Gaddis, J.D. CA BRE #01433800 NMLS#280011. For more information on Frontier Loan Group, Inc. please visit http://www.FrontierLoanGroup.com or visit Frontier Loan Group, Inc.’s YouTube page at Frontier Loan Group, Inc. YouTube. This entry was posted in Blog and tagged california HECm, california reverse mortgage, HECM line of credit, line of credit growth, reverse mortgage expert, reverse mortgage line of credit, reverse mortgage line of credit growth. Bookmark the permalink. ← Purchase Home Loan Accomplished in 13 days!